Fear of the dark - few phobias are more common across the spectrum of modern society. Horror, in all its shapes, sizes, and forms, often works by exploiting this. It’s an underpinning of vampire stories and almost all horror films save their goriest scenes for the night. By taking this to a literal extreme, Lights Out would seem to have uncovered a foolproof path to frightening audience members. Unfortunately, the film stumbles, offering too few legitimate scares and displaying an overreliance on traditional horror movie clichés. Is the PG-13 rating a problem? Possibly - it’s tough to generate the level of psychological intensity necessary for true terror when constrained by a kid-friendly rating. Is it a deficiency in director David F. Sandberg’s approach? Again, possibly, although he found success in the 2013 three-minute short upon which this feature length version is based. Or is it that the story isn’t as compelling as the concept? 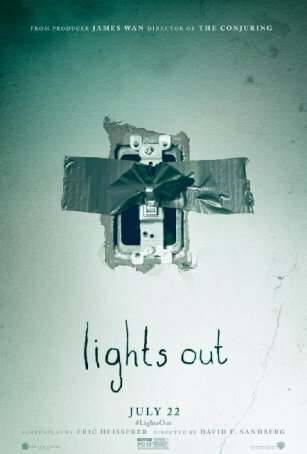 The premise of Lights Out is something we all accept as children but lose sight of as we grow older: monsters only come out when it’s dark. In this movie’s realm, the rule applies concretely. As long as there’s a light source, the demon/ghost/supernatural presence is constrained. But once the sun has set and the lights are out, it has free rein. In order to make this work, Sandberg must employ an army of contrivances to explain why lights are always going out, flashlights are failing, and candle flames are flickering. He also occasionally cheats. The creature can reside in a lighted area as long as it’s in shadow. And, in true horror movie tradition, all the characters make inexplicably stupid decisions. Lights Out starts as a conventional “child in danger” story. Elementary schooler Martin (Gabriel Bateman), who has recently lost his father (Billy Burke) in what we known to be a supernatural mauling, lives under the care of his deranged mother, Sophie (Maria Bello). Sophie is prone to erratic behavior, talking to herself, and engaging in congress with something unpleasant that hides in the shadows. Unable to sleep and fearing for his sanity, Martin approaches his grown-up sister, Rebecca (Teresa Palmer), for a place to stay. Eventually, Rebecca, Martin, and Rebecca’s boyfriend, Bret (Alexander DiPersia), venture into Sophie’s haunted house, which comes complete with unreliable lighting and a ghost with a bad attitude. For those who like scary movies, there are few things more viscerally satisfying than ghost tales that deliver. Those films aren’t about a coherent narrative or an airtight story. Their goal, quite simply, is to freak viewers out. To do that, all they have to do is create sympathetic characters, put those characters in harm’s way, and (most importantly) generate a suffocatingly ominous atmosphere, pregnant with tension and punctuated by moments of extreme terror. Although Lights Out does an adequate job with the characters, it fails to elevate its tone and style above those of any generic PG-13 horror movie. It’s a shame to see a clever premise developed in such an underwhelming fashion but that’s too often been the fate of horror concepts since Hollywood decided to tailor a lion’s share of the genre for pre-teens and young teenagers.